Japan's annual budget shortfall could be 23.2tr yen ($280bn; £176bn) by 2020, according to an official forecast. The figures - which are worse than previously estimated - come as government politicians are pushing for tax rises and economic reforms. Japan's government has pledged to turn its annual budget deficit into a surplus by 2020. Japan's national debt is already the biggest in the industrialised world, compared to the size of its economy. The latest forecasts underline the dire state of Japan's finances. The national debt is around twice the size of the economy. The ageing population means social security costs are growing. The Economic and Fiscal Policy minister, Kaoru Yosano, has warned the country is at a "critical point", and, without reform, risks losing investor confidence. 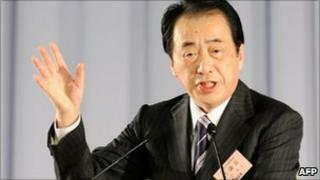 Japan's Prime Minister Naoto Kan has called for a national debate on increasing the 5% consumption tax to plug the gap. But he's hampered in building a consensus by the opposition's control of the upper house of parliament. It won elections to the chamber last year in a setback for the prime minister widely blamed on his suggestion then that taxes may have to rise.